It seems clear that marketing to children is not being based on principles of healthy eating and nutrition. In a study funded by the Robert Wood Johnson Foundation, quick service restaurant (QSR) television advertisements for children’s meals were compared with adult advertisements from the same companies to assess whether self-regulatory pledges for food advertisements to children had been implemented. All nationally televised advertisements for the top 25 US QSR restaurants from July 1, 2009 to June 30, 2010 were reviewed. 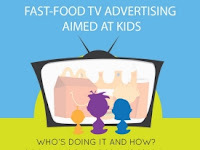 Almost all of the 92 QSR children’s meal advertisements that aired during the study period were attributable to McDonald’s (70%) or Burger King (29%); 79% of 25,000 television placements aired on just four channels (Cartoon Network, Nickelodeon, Disney XD, and Nicktoons). Visual branding was more common in children’s advertisements vs. adult advertisements, with food packaging present in 88% vs. 23%, and street view of the QSR restaurant present in 41% vs. 12%. Toy premiums or giveaways were present in 69% vs. 1%, and movie tie-ins present in 55% vs. 14% of children’s vs. adult advertisements. Median food image diagonal length was 20% of the advertisement diagonal for children’s and 45% for adult advertisements. The audio script for children’s advertisements emphasized giveaways and movie tie-ins whereas adult advertisements emphasized food taste, price and portion size. The authors conclude that children’s QSR advertisements emphasized toy giveaways and movie tie-ins rather than food products. Further, Self-regulatory pledges to focus on actual food products instead of toy premiums were not supported by this analysis. More work is needed to give children education about healthy eating.